The Big Four Café resides in the Romweber Flats building (formerly the Romweber Furniture factory). Named for the four major cities that it served; Cincinnati, Cleveland, St. Louis and Chicago and all points in between, the Big Four Railroad once traveled the tracts that ran through our small town on its westward routes. The tracks ran parallel to Pearl Street and were one of the main reasons that industry located nearby since they could economically transport their products across America. The Railroad Company chose Batesville as one of the its train stations because it could fill its steam engines with water from the well directly in front of the RomWeber Marketplace’s Depot Street entrance. To this day, the well still actively provides fresh water. It was not unusual for taverns and cafés, sometimes known as “beaneries” to open alongside the train stations to serve passengers. The Big Four Tavern in Batesville was such an establishment. Named after the railroad, it was located catty-corner to the original train station and was the oldest building in Batesville dating to 1853. Once home to a stage coach stop, it too depended on the Depot Street well to provide fresh water for horses. Tragically, in the summer of 2011 a wind storm damaged the Big Four Tavern building beyond repair causing it to be demolished. Fortunately for us, the memory of the Big Four lives on with the bar from the tavern, dating to the early 1900’s, being located in the Big Four Café. The bar, handmade by the predecessor to the Brunswick Corporation, Brunswick-Balke-Collender Company, is made of quartered oak, the bar top is mahogany and the mirror above the back bar was a single pour, a feat unheard of in its time. What you see before you is over 100 years old after a meticulous restoration. The historical elements of the Café are further enhanced by the use of doors that once graced the entrances to the Big Four Tavern. We kept the center doors to the Café, which are approximately 160 years old, as close to their original state as possible. The art work in the Big Four Café was reproduced from original marketing materials used by the Big Four Railroad and its successor the New York Central. Many of the historical elements used throughout the Café, such as the nearly century old lights overhead, were used in the old furniture plant that once resided on the property. 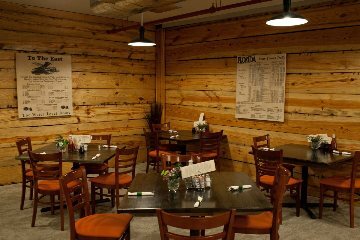 Table tops and the wood paneled walls in the corner of the Café were remanufactured from floor joists that were removed during the construction of an atrium in RomWeber Flats. They originated from the floors of one of America’s oldest furniture manufacturing plants, the RomWeber Furniture Company. The bell located at the end of the main hallway dating to the mid 1800’s, was a train bell used along the lines to call crew building new tracks to chow. You can almost hear its deep ring.